What do you think of Kate's style? Do you remember any other clothes she turned into it-pieces? She has a good style. With her figure she can wear almost anything and it will look good on her. I think that K and W are an adorable couple and I wish them all the best. its a joy for this couple and the newborn. They must be so happy that very day. Kate still looks so good!! You have really lovely blog! Kate is so pretty and elegant. Love her style. I loved Kate's dress, you picked out some more cute ones! I want number 2! love the color so much! Don't they look so happy with their baby? I like Kate's style. So far, still down to earth and stylish. She stays true to herself. Polka dots in pastel colours are so stylish for summer too. Holy crap, I'm sitting here right now, about to purchase #1 (ASOS dress) and this is all your fault haha. 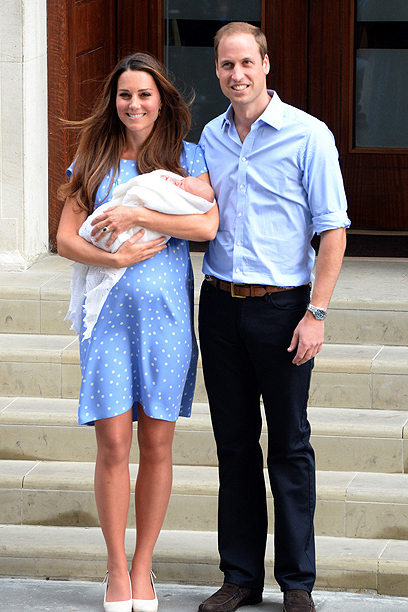 I did think her dress was really cute, it almost overshadowed the baby! I love your inspiration looks, like I said, I'm going to buy the asos dress. I love anything with polka dots!! They are really great and I like couples like that. Big love and she has an amazing and elegant style. Have a nice weekend. Great post! Yes Kate is always styled very gorgeous and classy!